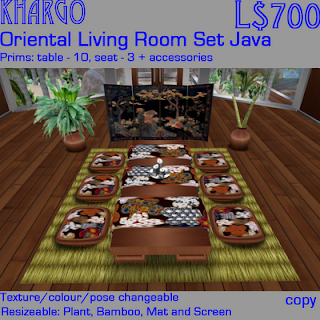 Khargo: Furniture and Design: Java Java Java!!! - 2 groups to retexture/ recolor (base has 17 textures and silk has 12 textures). - 2 groups to retexture/ recolor (table has 17 textures and silk has 12 textures). - 2 groups to retexture/recolor (13 different plant textures and 17 pot textures). - 1 group (18 rug textures). I'd like to say a big thank you to all the people who answered my call for models and gave their time - thanks Dylana, Ruby, Cyn and of course - Java!